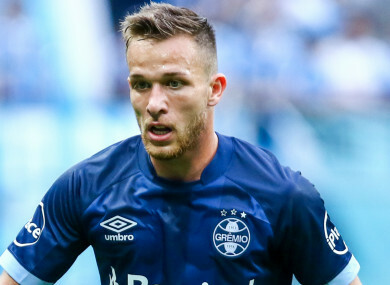 BARCELONA HAVE ANNOUNCED the €40 million signing of Arthur, the Gremio midfielder agreeing an immediate move to Camp Nou on a six-year deal. The 21-year-old arrives at the Catalan club with big shoes to fill as he is seen as the long-term heir to Andres Iniesta, who departed the club this summer. Nevertheless, Gremio had been insistent that they would be able to hold onto the youngster after they had initially thrashed out terms with Barca over a move that was expected to take place in January 2019. Iniesta’s exit seemed to speed up the whole process, though, and on Saturday the player revealed that he would move to Spain sooner than anticipated. Barcelona have confirmed that news. Email “Barcelona wrap up €40m deal for Brazilian Arthur”. Feedback on “Barcelona wrap up €40m deal for Brazilian Arthur”.